Despite its bucolic surroundings, the State College area is not exempt from unhealthy levels of air pollution, according to a new report by statewide environmental watchdog PennEnvironment Research and Policy Center. In 2016, the region experienced 76 days, or about 21 percent of the year, with smog or particulate matter above the levels that the Environmental Protection Agency has determined little or no risk. That number put State College in the middle of the pack for Pennsylvania. 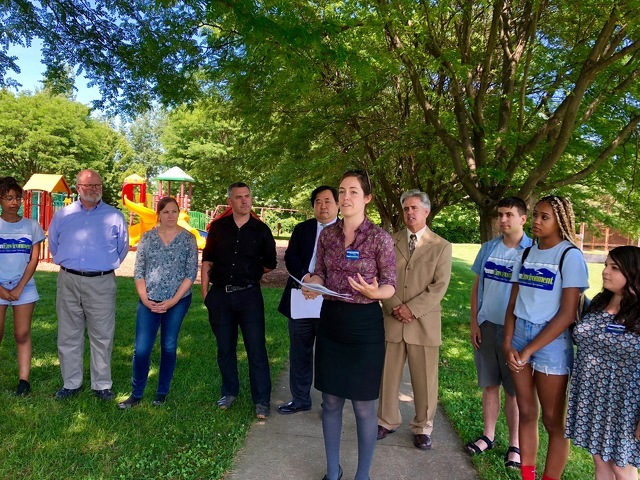 "As we stand here on this beautiful day, it’s really easy to think that the open spaces and rural nature of central Pennsylvania protects us from the air pollution that we associate with cities like Philadelphia and Pittsburgh," said Stephanie Wein, water and conservation advocate for PennEnvironment. Wein was joined Thursday in Tudek Park by local government officials to discuss the regional findings in "Trouble in the Air," a report that used EPA data to measure air pollution in Pennsylvania and across the country. The report calls on the federal government to strengthen clean car standards as well as the Clean Air Act, to allow states to adopt stronger vehicle emission standards and for additional policies to reduce pollution, including an increase in wind and solar power. That comes at a time when the EPA has taken major steps to roll back existing clean car standards and plans to review federal ozone standard. Wein said the organization was surprised, and troubled, to find State College above 75 bad air days. "When I come here I feel like I’m breathing really clean air," she said. Wein said that agricultural processes can play some role in the region's air pollution, but that it is largely due to vehicle emissions, particularly as the area grows and sees more cars and trucks on local roads. Smog and particulate pollution cause respiratory and cardiovascular health effects and can increase the risk for dementia, among other potential harm. Peter Buckland, chair of the Ferguson Township Board of Supervisors, said pollution impacts not only vulnerable populations of the very young, elderly and sick, but also healthy individuals. He said studies show very active people increase risk of respiratory problems from the sheer volume of polluted air they inhale when exercising outdoors. "PennEnvironment’s report shows our elected officials and industry are failing to live up to the trust that the people have put in them. Buckland noted that Ferguson Township and State College have been progressive in adopting environmental measures in recent years, both being the only communities to pass an environmental bill of rights by referendum. Ferguson Township also adopted a resolution to draw down its carbon emissions to zero, signed onto the national campaign committing to the 2015 Paris climate agreement goals, and created a climate action committee that's also working with the Centre Region Planning Agency. State College Mayor Don Hahn said he is proud to be mayor of a borough that adopted an environmental bill of rights, that has been on path for reducing carbon emissions for more than a decade and has pioneered other environmental measures. But, he said, it's clear more large-scale change is needed. "We can no longer afford to think globally and act locally," Hahn said. "At this point we need to act globally and nationally and we need to insist our state and federal representatives do the same." Wein added that it's good for individuals to take personal measures, but that much more is needed. "It is great to start at home, and people can always do things to make their lives more efficient, but ultimately no individual consumer is going to save our air and protect our health," she said. "It’s systemic change. Folks at home, after they switch out to a more efficient light bulb, the thing they need to do is call their members of Congress, to call on Sens. Casey and Sen. Toomey, to call on the Trump administration and to call on our state representatives to step up where the federal government has been reluctant to." "When you look at health it’s not a political issue and it shouldn’t be a donor-driven issue. It’s an issue that affects every generation," he said. "The future for our children, for our jobs and for our environment isn’t about standing here and saying something ‘s wrong, but about using the science we have before us and saying we can do what’s right and we have to do what’s right." Both Buckland and Hahn also said clean energy is good for job creation, with Buckland more people now work in clean energy than fossil fuel jobs. "America needs to realize that clean energy and energy-efficient technology are important. They’re job creators," Hahn said. "All the major economies realize the importance of it and it’s important for America to get on board to exercise some economic leadership in this matter rather than trying to deny the importance of all this." Nearby areas in west-central Pennsylvania fared worse than State College in the report. Altoona had 81 bad air days and Johnstown had 102 . Lancaster and Lebanon had the most bad air days, with 179 and 177, respectively. Though they both had more than 100, the state's two largest cities, Philadelphia (111) and Pittsburgh (121), weren't even in the top five for most bad air days. Wein said that higher temperatures drive up smog levels, and that if heat waves persist as a result of climate change, the situation will only get worse. "If we want to make dirty air days a thing of the past we need to strengthen air quality protections and reduce global warming emissions," she said. "Burning fossil fuels… creates the smog and particulate pollution that puts us at risk." Like you, Tommy Stevens isn't sure who Tommy Stevens is going to be in 2018. 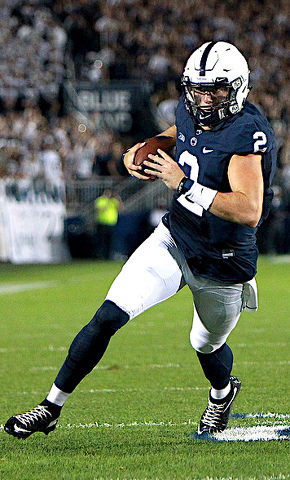 Will he be the talented back-up quarterback to a Heisman Trophy candidate? Or will he be The Lion, a pass-catch-run triple-threat playing a potentially potent position concocted by head coach James Franklin? A position at least in word, if not deed, if 2017 is any guide.